This last weekend my husband and I continued our training to hike Mount Rainier this fall with a hike up Pyramid Peak. (Many thanks to family and friends who watched the kids at camp!) We decided to take the scenic route and check out Dead Lake on the way. Dead Lake is the lowest elevation of the six sub-alpine lakes in Great Basin National Park. It is formed in a moraine and lies about 9570 ft elevation. An old road goes most of the way to the lake, and starting on the turnoff from the main Snake Creek Road (see map at bottom; near the Shoshone trail at the road junction), we began hiking at an elevation of about 8200 ft. The road is easy to follow, traversing mixed conifer, then meadow, and aspen stands. Although the road is easy to follow, it is steep! I was happy to pause to take a photo of this majestic ponderosa pine surrounded by green leaf manzanita (Arctostaphylos patula). Photo stops = catching my breath! Following the rock cairns, you arrive at this luscious meadow. A small creek (South Fork of Snake Creek) meanders through the meadow. It's one of the prettiest spots in the park. If you'd like a detour, follow the creek up to its source--several scenic springs surrounded by conifers. If you want to get to Dead Lake, cross the meadow and keep heading north. We lost the rock cairns and wandered a bit. Of course wandering can lead to some beautiful sights, like these pinedrops (Pterospora andromedea). they used to belong to the Monotrapaceae (Pinedrop) Family but have been reassigned to the Ericaceae (Heath) Family, the same family that manzanita belongs to. What color are the pinedrops? Where's the green, the chlorophyll necessary to absorb energy from light? Well, they don't have any chlorophyll. The pinedrops are parasites that rely on mycorrhizal fungi that are themselves parasites on conifer roots. For more, see this Southwest Colorado Wildflowers page. For parasites, they're quite pretty! Eventually we spotted a bare spot among the dense trees and found a big opening. But we didn't see a lot of water. Or even a lake. We found a puddle. Dead Lake frequently is very low like this in the summer and fall. Researchers from the Ohio State University have done a sediment core on the lake and found that the lake has gone dry in the past. One recent year it was only about 5 feet across, so the puddle we saw on this day was actually quite a bit larger. I walked around the lake, checking it out. A PVC pipe on a post was sticking above the water. This is part of a National Park Service project to monitor lake water levels and temperatures. Right now the lake is about eight inches below the lowest hole in the PVC pipe. Despite the low water level, the reflections are gorgeous, and in the fall, when the surrounding aspens turn color, this is a beautiful spot to visit. It was 1.8 miles to get to Dead Lake, and over 1300 ft elevation gain. With heavy backpacks, it took us 1 hour and 20 minutes to get there. The UTMs for Dead Lake are 11 S 736259 4313177. Next up: going up Pyramid Peak from Dead Lake and the sights along the way. Above is a Say's Phoebe nest, fairly similar to that of a barn swallow, but not quite as tight construction. Say's Phoebes like to build their nests on buildings. We had quite a kick watching the mom feed the birds. As I was doing breeding bird surveys, I found that there was usually one dominant species that sang so much that I had to work hard to block out its song (or rather their song, as usually several were singing at the same time) to hear the other birds in the area. Bird surveys usually require more identification by ear than by seeing the bird. To learn and refresh bird songs, the Great Basin Bird Observatory has a super little free program for birds of the Great Basin. Here's the dominant bird for upper sagebrush areas. Do you know it? The bird I heard most in riparian areas was the Warbling Vireo. When I came across one in a nest, I understood why, it didn't move at all even though I walked right underneath. It just kept singing its song. The big mama turkey was easy to spot, but it took me a bit longer to see the grass moving behind her as her little babies followed her around. They couldn't have been able to see much, as the grass was much taller than they were. If turkeys were only native here, I could like them a lot better. This MacGillivray's Warbler sang his little heart out, and not far from me. These birds like riparian areas. The song of this bird threw me a few times. Fortunately it's a bird that likes to perch at the top of trees, so I could spot it and get a definitive i.d. Sometimes I wish a lot more birds would like to perch high! Lazuli Bunting--one of the most beautiful birds around! One day I came across this Red-naped Sapsucker on an aspen tree. I watched to see what it would do. All of a sudden it disappeared into a hole in the tree! Are you still seeing any breeding birds? I am still enjoying the birds around me, but have to admit that I've been introduced to the world of butterflies and have now been enthralled photographing and identifying them. Time to get another post ready! In the last post I shared our hike up Mount Moriah. Today we're going to stay with the North Snake Range, where a small lightning-strike caused fire has been blown by strong, gusty winds into a large wildfire. At first you might say, "Oh no, the poor forest is burning!" What I'm saying, as an ecologist, is "Hurray, that forest really needs to burn! The aspens might have a chance of surviving if the encroaching conifers are burned back, and the bighorn sheep habitat should be vastly improved." What my husband, the rancher, says, "Good, those canyons are overgrown with too many trees and fewer trees means more water will be coming out of the canyons." What is certain is that over one hundred years of fire suppression has caused for some very dense understory. If you've ever tried to hike off-trail in the Snake Range, you know what I mean! The fire was under a 100 acres for the first few days just in the Hampton watershed. Strong winds blew it over into Little Horse and Horse Canyons. The first night the fire got big, the ridgetop glowed at night. The fire had been updated in size to 4500 acres, and we wanted to see it from a different angle. We drove up to the road towards Horse Canyon and found smoke emerging from several canyons, but it wasn't coming from the mouth of any of the canyons. A helicopter flew over. More and more aircraft are involved with fires now. It can make it easier to see what's going on and to respond in some cases, but aircraft really add to the cost of a fire. As the light faded, we saw headlights approaching from both Horse and Smith canyons. The Gila hotshots had been up there. While the fire was small, a wildfire monitoring crew from Colorado was stationed there. Now there are over 100 personnel on the fire since it covers much more ground. The fire is really cleaning a lot of forest! For the most up-to-date information, check out the Ely Fire Facebook page. A few weekends ago we headed to the Mount Moriah Wilderness in the North Snake Range. After a very pleasant evening camping at the Big Canyon trailhead, we had a leisurely start to our destination: the top of Mount Moriah, at 12,050 feet. The trailhead is nearly 10,000 feet high, so we figured this wouldn't be that hard of a hike, especially since we had already conquered Wheeler Peak a few weeks previous. So we took the kids, and figured we'd be back in a few hours. 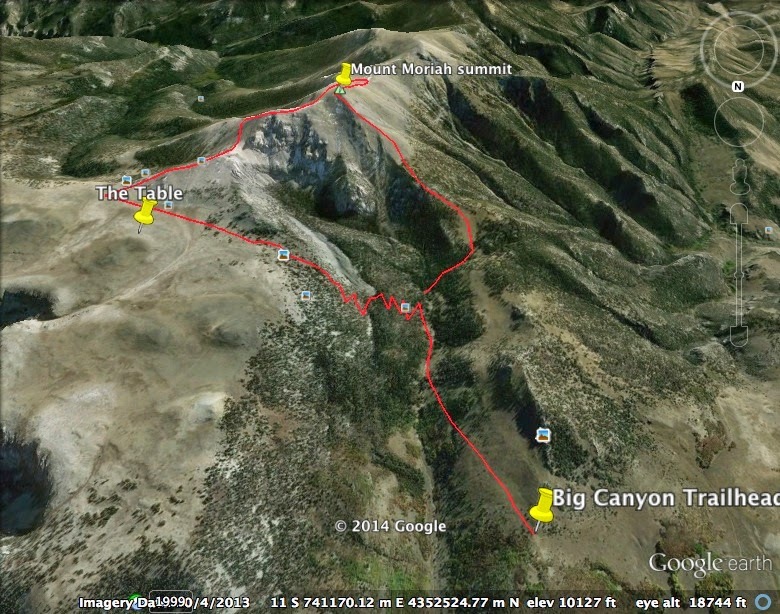 The first part of the trail went down into Big Canyon, then crossed it at about 1 mile in, and then the trail got steep, heading up to the Table, a huge high-elevation plateau. Even though we had only hiked slightly over two miles and gained a bit over 1,000 feet in elevation, we were all getting hungry. We stopped to have lunch under one of the old bristlecones. Desert Girl was pleased with her double-double sandwich (a pb&j doubled over). We were disturbing swarms of moths as we walked, and we saw the green gentian (elkweed) covered with the army cutworm (or "Millers") moths. Due to the mild winter, we've had an outstanding number of them this year. After lunch we continued on the trail towards Hendry's Creek, and then at a rock cairn headed up toward the peak. It was so much fun when we got to a big patch of snow! Desert Girl had to make a snowwoman. She was very bright in her tech t-shirt and pink tutu. I've long ago decided she can wear whatever she wants as long as she hikes. Quite a variety of flowers were blooming, lending a nice distraction to the gain of elevation. As we reached the saddle we found more snow and also a faint trail heading across the backside of the mountain. The trail turned out to be quite faint, but we all managed it. The trail kept getting fainter and fainter, but we followed it around to the south end of the mountain (if I did it again, I would head up sooner, because there was no trail at the south end of the mountain). Desert Girl got a ride up the last part, but Desert Boy had to do it on his own, with some coaxing. We made it, though! Even our dog Henry got to the top. We carried extra water for him, as there is no water on the hike except if you find snow. Desert Girl had fallen asleep, so my idea of a family photo on top of the mountain didn't work out. We took a little rest and signed into the register. The register is in stark contrast with the one at Wheeler Peak. More people climb Wheeler Peak in a single day then often climb Mount Moriah all summer. If you want some solitude, this is the place to come! The views were outstanding. To the north we could see the wide table, and then off in the distance the Deep Creek Mountains, with Ibapah Peak topping out at 12,067 ft.
To the northeast we saw Gandy Salt Marsh and lake, with the Confusion Range and Fish Springs Range beyond. To the southeast we saw EskDale and the Ferguson Desert. To the south we saw Jeff Davis and Wheeler Peak and the South Snake Range. And to the northwest we saw more of the North Snake Range. It really has a different character than the South Snake Range. It's a lot bumpier, for lack of a technical term. (If you'd like to learn about the geology, here's a link to the Nevada Bureau of Mines and Geology Bulletin on the area.) Everywhere we looked we saw swarms of moths. It was 4.5 miles to get up to the top of the mountain coming around the backside. My husband and I looked at each other. We didn't want to go 4.5 miles back around, especially since Desert Girl was still asleep and so had to be hauled. We could see our truck parked at the trailhead, so we decided to go down the northwest slope, into a meadow, down a drainage, and meet up with the trail at the bottom of Big Canyon. Hopefully it wouldn't be too difficult. As we went down the steep slope (which showed evidence that other people had been using it too, making us feel better), I noticed some figures down on a flatter spot. I looked closer and realized we were seeing five bighorn sheep. Hurray! They wandered off as we got closer, but then one came back to check us out. Desert Girl woke up and was ready to hike again. We descended quickly, and soon the peak looked far away up its northwest shoulder. Before long we were in a limber and bristlecone forest, going down quickly into a meadow. It was steep! We followed a gully back to the trail, and that part had some fun challenges for the kids. Finally we made it back (that last part going up hill isn't easy)! It was a longer hike than we expected, with 4.5 miles up and 3.0 miles down and over 2,000 feet total elevation change. Desert Boy hiked the whole thing, and four-year old Desert Girl hiked 5.5 miles of it--she's going to be one awesome hiker. 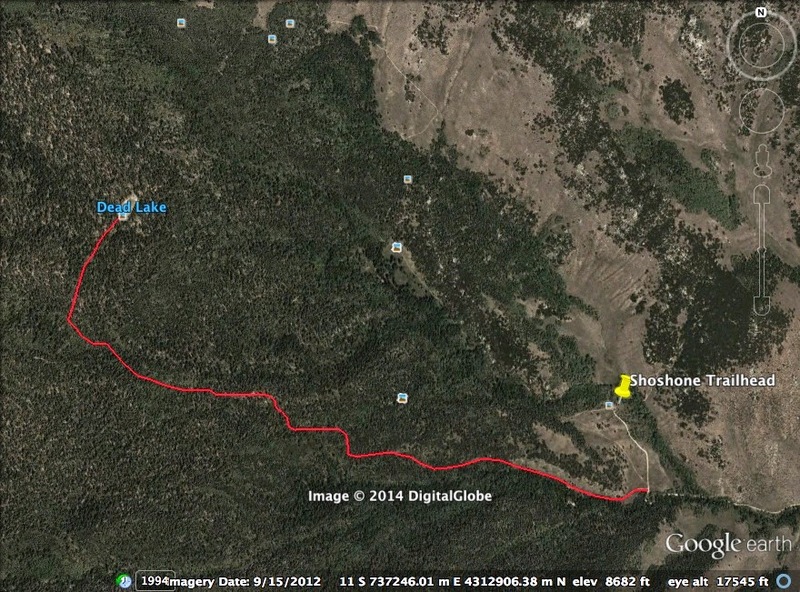 Below is our approximate route, looking south. It was a great feeling to have accomplished that hike. The only people we saw all weekend were two guys leaving the trailhead area when we pulled in. We had the trail all to ourselves. To learn more about Mount Moriah and the North Snake Range, check out Chapter 10 in my book Great Basin National Park: A Guidebook to the Park and Surrounding Area .